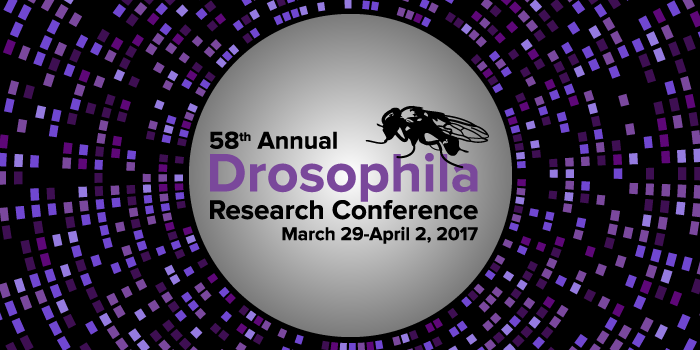 Don’t miss out on this year’s Annual Drosophila Research Conference: The late abstract deadline is January 23, 2017 and the early registration discount ends February 3, 2017. Check out the fantastic lineup of invited speakers below! More details of the conference are available here, including details of special events like the PI Early Career Forum, the How I Fly (HIF) ScienceSlam, How to Get Published breakfast, and the Meet the Speakers Careers Luncheon. Thanks in large part to Drosophila research, the past thirty years have proved a golden age for understanding evolution at the molecular level. But at the planetary scale, the same years have seen such precipitous declines in the animal kingdom that the fates of many major groups are in serious doubt. Carroll will recount some of the key conceptual insights into animal evolution that were spurred by work with Drosophila and will highlight efforts to reverse the destruction of one major wilderness. The Drosophila testis provides a paradigm for understanding stem cells. Erika Bach and her colleagues have shown that the ability of a stem cell to self-renew depends on how well it competes with its neighbors for space at the niche. They are currently studying stem cell sexual identity, which is critical for fertility, and stem cell differentiation. Their work shows that somatic stem cell differentiation is controlled by PI3K/Tor signaling and that the local production of positive and negative Insulin receptor signals regulates the differentiation niche. Most recently, they have investigated the biological significance and molecular mechanisms underlying germline de-differentiation. Their results show that de-differentiation is not critical to the germline stem cell pool under standard laboratory conditions. However, under challenging conditions like starvation, de-differentiation regenerates the niche with highly proliferative stem cells through a Jun N-terminal Kinase-dependent mechanism. Genetically identical twins look remarkably similar; they have a reproducible adult phenotype. How does the genome guide cell behavior during development to achieve this feat? To better understand tissue refinement—the phenomenon of noisy behavior at the cellular level giving rise to a well-ordered tissue—Buzz Baum and colleagues investigate development of the Drosophila dorsal thorax. They have identified roles for filopodial-dynamics in tissue patterning and for oriented cell division and cell delamination in refinement of cell packing. Their data help to show that you don’t have to be tidy to make something beautiful. Eukaryotic genomes are typically riddled with transposons and their remnants, which can pose threats to genome integrity. The major eukaryotic responses to this challenge involve small RNA silencing pathways. By fuelling small RNA biogenesis with transcripts of the targets themselves, this system provides flexibility and adaptability to sequence drift and the horizontal invasion of new transposons. Transposons, however, resemble the protein-coding genes of the cell. A major challenge is therefore to distinguish ‘self’ transcripts from ‘non-self’ transcripts. Research in Drosophila continues to reveal the conceptual logic of the piRNA pathway, the central transposon suppression system in animal gonads. A comparison of all genes and mutations causing natural phenotypic variation in animals, plants, and yeasts revealed that certain pleiotropic genes (svb, ebony, pdm3…) are hotspots of morphological evolution. But how can such genes fine-sculpt detailed features of organisms during evolution? Studying Drosophila santomea bristle patterns, Courtier-Orgogozo and colleagues have found that even though an enhancer may drive expression in multiple body parts, some of its mutations may affect only certain bristles. Their work shows that the existence within the genome of transcription factor binding sites used in a limited set of cells allows the evolution of circumscribed morphological changes. Sometimes a cell must divide asymmetrically—producing two daughter cells with different developmental fates. During asymmetric division, fate determinants at the cell cortex segregate unequally into the daughters. Biased dispatch of Sara signaling endosomes in the cytoplasm is also known to mediate asymmetric Notch/Delta signaling during asymmetric division in several systems. How can organelles localized away from the cellular cortex be dispatched unequally during division? Gonzalez-Gaitan and colleagues have unravelled the mechanism, down to its physics, showing that endosome asymmetry is driven by generation of a microtubule asymmetry of the central spindle. Inverting this spindle orientation targets the endosomes to the wrong cell. Insect endosymbionts were once viewed as fascinating oddities. Over the past decade, it has become clear these symbionts are ubiquitous and central to the biology of their hosts. However, the basis of phenotypes caused by endosymbionts remains largely enigmatic. To fill this gap, Lemaitre and colleagues are investigating the interaction between Drosophila and its endosymbiont Spiroplasma poulsonii. They will dissect key features of the symbiosis, including vertical transmission, male killing, regulation of symbiont growth, and symbiont-mediated protection against parasitic wasps. This knowledge will serve as a paradigm for other interactions (eg. Wolbachia) that are less amenable to genetic studies. Internal organs constantly exchange signals. Even in fully developed animals, organs can undergo profound anatomical and functional changes in response to both environmental information and internal states. Using the intestine and its neurons as a model, Miguel-Aliaga and colleagues have explored the physiological roles of enteric innervation, and characterized communication between the gut, its neurons, and other internal organs. This includes a mechanism, reminiscent of mammalian neurovascular interactions, whereby neuronal control of tracheal branching mediates adaptations to malnutrition. They are also exploring the plasticity of the intestinal epithelium, revealing unexpected sexual dimorphisms and intestinal contributions to reproductive success. The gastrointestinal epithelium faces constant damage due to its digestive/barrier functions and its exposure to chemicals and pathogens. To cope, the gut relies on restricted populations of adult stem cells that ensure fast and efficient repair throughout adulthood. Payre and colleagues investigate how signaling pathways regulate stem cell behavior, recently showing that several pathways converge upon Ovo/Shavenbaby, a transcription factor regulating epithelial remodeling during differentiation of epidermal derivatives. They find that posttranslational control of Ovo/Shavenbaby is important for epidermis development in response to small-ORF–encoded peptides. These mechanisms are reused within adult stem cells to orchestrate the balance between proliferation and differentiation of stem and progenitor cells. Darwin’s “mystery of mysteries” was the problem of speciation and the evolution of reproductive barriers. Why would natural selection tolerate the onset of genetic barriers such as hybrid sterility? The key to this problem involves understanding the molecular mechanisms of hybrid dysfunction. But even in the post-genomic era, very few hybrid sterility or inviability genes have been identified, and we know even less about the evolutionary forces and the disrupted molecular pathways involved. Phadnis and colleagues have revealed cellular and developmental anomalies in interspecies hybrids that provide surprising insights into the otherwise hidden evolutionary conflicts that ultimately shape the architecture of our genomes, cells, and species. RNA polymerase II (Pol II) pauses downstream of the transcription initiation site before beginning productive elongation. This pause is a key component of metazoan gene expression regulation. Some promoters have a strong disposition for Pol II pausing and often mediate faster, more synchronous changes in expression. This requires multiple rounds of transcription and thus cannot solely rely on pause release. But it is unclear how pausing affects the initiation of new transcripts during consecutive rounds of transcription. Zeitlinger and colleagues find an inhibitory effect of pausing on initiation and propose that paused Pol II prevents new initiation between transcription bursts, thereby reducing noise. Animals can choose which behavior to generate based on sensory inputs and previous experience. Zlatic and colleagues dissect the logic of memory-based behavioral choice in Drosophila larvae. They have reconstructed a complete wiring diagram of the Mushroom Body (MB), the neural structure involved in associative learning. This includes pathways from the conditioned (CS) and unconditioned sensory (US) neurons to the MB, and the interactions between MB output neurons and circuits that mediate innate responses to CS and US. They elucidated the logic of punishment and reward encoding by the ensemble of dopaminergic MB input neurons, as well as the logic by which the MB interacts with pathways for innate responses.